Unlike the railway line Swakopmund and Windhoek, which was mainly built to solve transport problems after the rinderpest in 1897. the Lüderitz-Keetmanshoop line was mainly built to supply infrastructure to assist the suppression of the Nama rebellions that erupted in southern Namibia in 1904. Due to the long communication lines between Swakopmund and the interior, the German government decided to deliver their war materials directly to the front in the south via the harbour town of Lüderitz. In December 1905, the German government announced that a railway line would be built from Lüderitz to Kubub. On 31 October 1907 the railway line reached Aus, from there it was gradually extended to Keetmanshoop. The building of the railway line caused Lüderitz to enter a new phase of development. Shipping increased, and cargo transport to the interior started to take place on a large scale. Various well-know trading operations started and the population of Lüderitz increased overnight. In 1908, August Stauch, then in the service of the Deutsche Eisenbahnbau und Erhaltungs Gesellschaft (DEEG, “German Railway Line Construction and Maintenance Company”), was responsible for the discovery of the first diamonds on Namibian soil near Kolmanskop in the vicinity of Lüderitz. Several diamond fields mushroomed along the coast overnight and the riches at Lüderitz attracted worldwide interest. Adventurers rushed into the arid Namib Desert in an attempt to become rich overnight. The fast growth of the population led to the sudden overburdening of the railway line’s capacity. Whereas, beforehand, only main cargo had been transported, now the railways had to convey passengers as well. The existing station building at Lüderitz was incapable of handling the unexpected accumulation of passengers and the sudden increase of freight. In 1912 the German Imperial government granted permission for a new station building to be erected. The building contract was awarded to the construction company Albert Bause in Lüderitzbught, which completed the works in April 1914, shortly before the outbreak of WWI. It was the very last major building to be constructed by the German colonizers in the colony. Although the station building features a number of embellishments like a crow’s nest, bull’s eyes and cartouche on the gable, the building displays a modern style in its combination of technology and building art. This element was indicative of the emergence of modern architecture in Germany at the time. 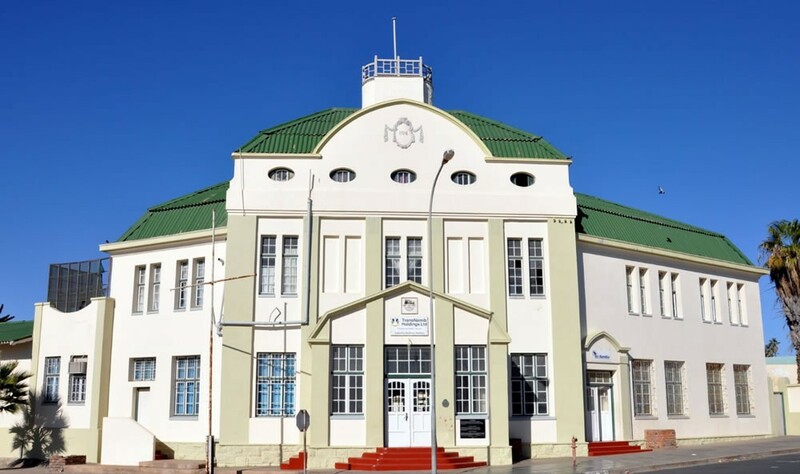 The station building, which was erected in Lüderitz’s heyday, still forms an attractive unit with the numerous other double-storeyed buildings in the town that date back to the colonial era, and contributes to the town’s continuing German atmosphere. The station building is still in use, and the structure – inclusive of its façade – is still in an entirely original state. The building is situated on the corner of Bismarck and Bahnhof Street in Lüderitz. The Station Building was proclaimed a national monument on 13 December 1976. Text supplied by Willem Kotzé.